A beautiful, yet complicated painting: What is going on in the disk around HD 142527? This guest post was written by Arianna Musso Barcucci. Arianna is a 2nd year PhD student in the Planet and Star Formation department at Max Planck Institute for Astronomy in Heidelberg, Germany. She works on direct imaging of extrasolar planets and their environments, with a particular interest in the early stages of planetary formation and evolution. When she is not hunting for planets, she enjoys reading, hiking and painting. Status: Published in Monthly Notices of the Royal Astronomical Society (MNRAS) Issue 477, open access on arXiv. Figure 1. The stunning disk around HD 142527. You can nicely see the outer disk with the two shadows and a hint of spirals, as well as a glimpse of the inner disk (the blob of light in the very centre of the image). But the wide variety of features and phenomena taking place at the same time makes this disk a puzzle to interpret! So far, there is no explanation for the entire artwork at once. 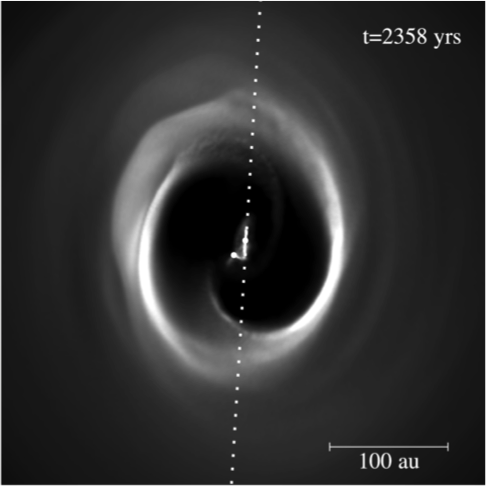 As shown in Figure 1, the environment around HD 142527 is wild: several multi-wavelength observations over the years have discovered an outer disk facing us and an inner inclined one, separated by a cavity. Six spiral arms have been detected around this object. Finally, researchers have identified a “horseshoe” in the outer disk, which is brighter than its surroundings, plus two dimmer areas, recently interpreted as being shadows cast by the inner disk onto the outer one. ALMA observations of this object also show rich gas kinematics. On top of all of this, the central star is home to a close-in massive companion, between one-twentieth and one-third the mass of the Sun, which is known to be accreting gas from the surrounding area. The close-in companion has been suggested as possible culprit for the whole system’s appearance—it’s hard to keep a disk orderly when there’s a small star rolling around in there!—but the question remains of how an object orbiting 13 AU from the star could carve out a cavity at more than 90 AU. The authors of today’s astrobites paper take a step back and look at this beautiful painting as a whole, accounting for all the components and features at the same time, to test the hypothesis that they might all be due to the known close-in companion. How do they do it? With a full-on hydrodynamic simulation, of course! You can think about a 3D hydrodynamical simulation as a playground game where all the players have to follow certain rules. In the playground, the authors place a central star and a planetary companion, with fixed initial masses (1.8 and 0.4 times the Sun’s mass, respectively). Then they add a separate set of small particles which represent the dust and gas that compose the disk. Next, they specify the rules: The companion has to orbit the star according to a chosen orbital eccentricity, distance, and orientation. The disk’s particles are allowed to move, but they must follow the gravitational influence of the central star and companion. The disk particles also have to act like a gas, flowing with a pre-set viscosity, and dragging each other (and the heavy companion swimming through them) accordingly. Then they let the system play! After the disk evolves for a while, the authors want to know how the disk would appear to an external observer. They let the central star and companion “shine,” according to predefined temperatures and luminosities. Assuming the disk is mostly made of small silicate dust grains, they compute how the disk would absorb or reflect the light radiated from the star and the companion. In this way, they turn the hydrodynamical simulations into images to be compared with the actual observations! The authors are particularly interested in seeing how the final appearance of the disk changes as a function of some key parameters, like the eccentricity of the companion’s orbit. Their goal is to find out which set of conditions could reproduce the disk observed around HD 142527. Success! After changing various parameters, they successfully reproduce a disk very similar to the observed one (see Figure 2). Do yourself a favour and go check out the amazing simulations they did! Figure 2. This is one of the possible appearances of the disk after ~2300 years of evolution in the presence of the binary companion. The dotted line marks the position of the shadows as expected from the simulated inner disk. The conclusion is quite clear: the artist behind this messy yet spectacular disk is indeed the close-in companion. However, the object must follow certain rules: it must orbit in the same plane as the inner disk, on an highly eccentric orbit with maximum distance from the central star not greater than 40 AU, and it must be in a phase of its orbit in which it is approaching the central star. Only if all of these requirements are satisfied can the companion be held responsible for the disk structure and morphology. The observed companion ticks out all of these requirements: we have found our painter! The authors conclude that, if the case for HD 142527 can be considered the norm, then other transition disks (i.e: disks with cavities) might be similarly explained by the presence of a close-in massive companion. However, it might be very difficult to find these hidden painters! 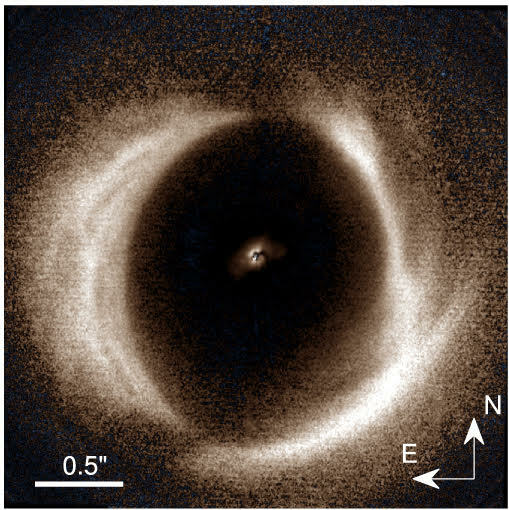 Even very massive stellar companions (as in the case of HD 142527 ) might manage to hide themselves inside the disk, eluding detection (for an insight in the tricky business of direct imaging of extrasolar planets, have a look here). HD 142527 proved that it is possible, with tons of observations and a lot of simulations, to explain the appearances of even a very intricate disk. This success should not remain isolated: in-depth study of other, similar disks is required in order to keep unveiling the hidden mechanisms of these beautiful works of a̶r̶t̶ nature.